Forgot the pattern? How u can unlock your android phone now? 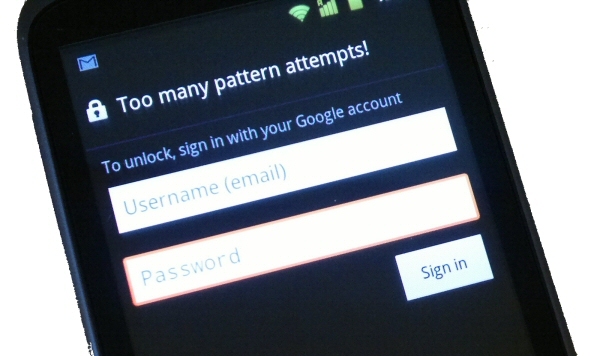 Don’t worry… This article will cover the way you can unlock any android device if you forgot the pattern. Phone pattern is very important for the phones containing personal files or personal data. This will protect your phone from unauthorized use and you will be satisfied that your data is saved. But the actual problem starts when you forgot your android phone pattern. No need to be worry now. Here are some of the simple techniques you can use to unlock android phone and to have access on it again. 2. Select next option. After selecting this you will see more two options – one saying answer the security question and the other will be saying give details of your Google account. Remember one thing in mind when ever you start using any android phone, you need to provide details of your account. Doing that is so helpful for you in many other ways too. 3. Most of us avoid setting a security question. If you have a security question then answer it simply and unlock your phone. If no then click on the ‘next’ option. 4. After selecting Google account option, provide your username and password in respective columns present on your phone screen. 6. After doing so you are able to choose new pattern for your phone and can have access to your android phone again. But if you are not already connected to the internet, you will not be able to sign in to your Google account. If this happens to you the you should try out the second method listed below. 1. Power off your phone and take battery out for some time. 2. Insert battery back to your phone. Now press volume up, power and home button simultaneously till your phone get restart. Note: In many android phones ‘home’ option is not available. So you can also try volume up and down and the power button at the same time. 3. The logo screen will appear. When you see this screen leave the power button only, keep pressing the rest of two buttons. 4. You will see the list having some options. Use volume button to select the options. Go to factory reset option and press the power button. 5. If it ask for confirmation select yes and let the action begin. 6. When it gets completed reboot your phone. Pattern will get disappeared and you can have access to your phone again. You can choose new pattern for phone now. P.S: The second method will lose all your personal data including pictures, files, messages, Downloaded items and different applications as well. So this is how to unlock Android phone if you forgot the pattern. Please use one of the two methods to unlock your Android phone. And if you are having any problem then feel free to write us in comments.